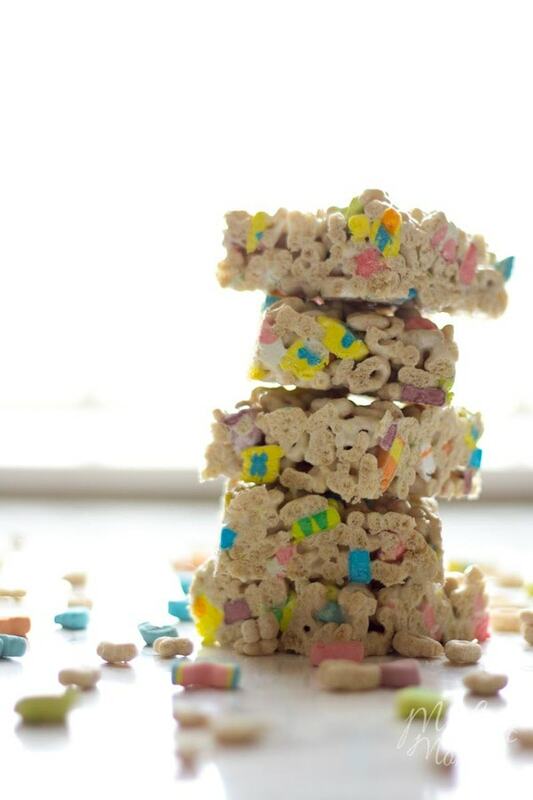 If you love rice krispie treats then you are going to LOVE these Lucky Charm Marshmallow Treats! 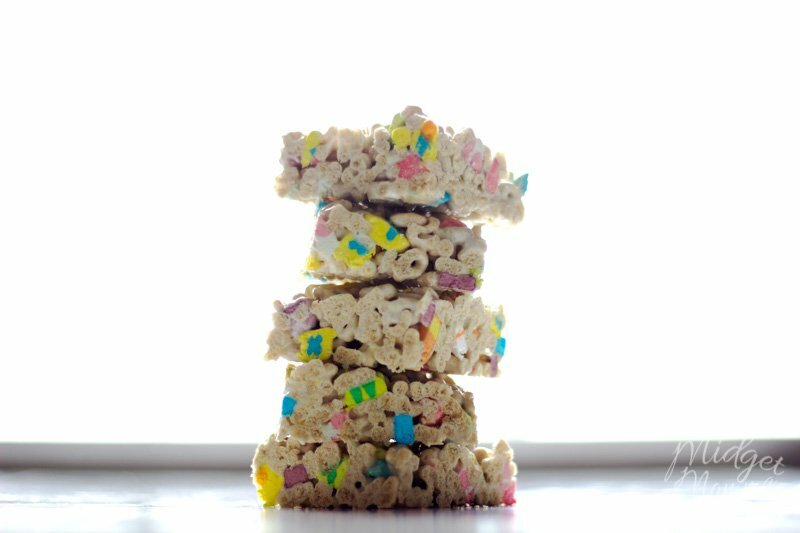 They are the perfect way to change up your loved Rice Krispie treats! There really is nothing better to remind me of when I was growing up then Rice Krispie treats. I have always been a rice crispy fan and it was a treat my mom would make for us. 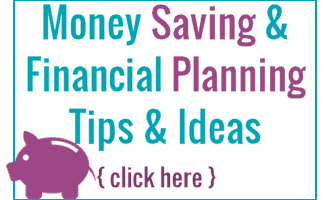 Of course you all know me, I like to change up the traditional ways and put a fun new twist on them. And tada! We have Lucky Charm Marshmallow Treats! 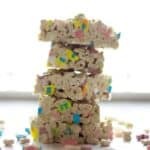 They are even better then your normal rice krispie treats, I know, I know you are seriously doubting me right now but trust me. 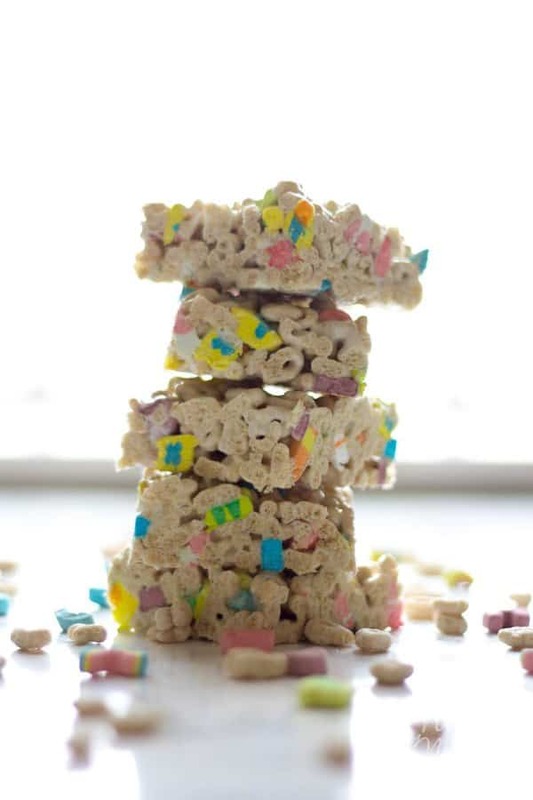 Adding marshmallows, with sugar coated cereal and marshmallows makes one amazing treat! If you are looking for an awesome easy St. Patrick’s Day dessert this is the one! Or if you are like me, who may have accidentally forgotten that it is St. Patrick’s Day on more then one occasion this is the perfect quick kid friendly dessert! Grease a 9x9 square pan with the cooking spray. In a large microwave-safe bowl place in the marshmallows and butter. Place them in the microwave for 30 seconds at a time till they are melted. Stir the cereal into the marshmallow until well combined. Pour the mixture into the pan and press it out to fill the whole pan. Place in the refrigerator for 20 minutes until the marshmallows set up. Slide a butter knife around the edge of the pan to loosen the treats from the sides.Cut the treats into 3x3 squares. If you like thick treats you can use a 9x9 pan and if you would like them thin you can use a 9x13 pan. When you spread out the treats you can a sheet of wax paper that has been greased with pan spray.